Detroit Observations - Cars! Cars! Cars! Oh, not our observations (we're busy looking elsewhere), but the astute observations of others. First up is our buddy Phil. 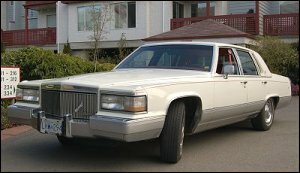 He writes about an old Cadillac over at that finally came out of hibernation. We've snagged Phil's snap of the car for illustration purposes only. Guess what year that Cadillac is? Nope. Nu-uh. Try again. Go read Phil's piece to find out the year of this beast and then realize that Detroit screwed themselves by being so far behind the times it's laughable. How could they have been making cars that looked like this for so long and still be around to say, "Hoo-boy, we stretched that line a wee bit long, eh?" At least Cadillac has turned it around (more or less). The Town Car hasn't changed in about 54 years. Winding Road reports: Chrysler Dealmaking: Oh, What A Difference 12 Years Make. Ha! Don't things usually get more expensive as time goes on? Way to raise the bar on sucking, Chrysler!